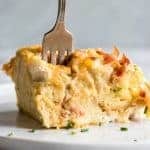 Overnight Bacon and Cheese Strata. This prep ahead breakfast is loaded with eggs, bacon and cheese. Preheat oven to 250. Line a large baking sheet with a silicone mat or foil. Spread the bread cubes out in a single layer on the baking sheet and bake for about 5-10 minutes, until dried out. Spray a 3 quart baking dish with non stick spray. Add the dried bread cubes, crumbled bacon, shredded cheese, and chives. Carefully stir to combine and mix up. In a large measuring cup add the 8 eggs. Then add milk or cream to equal out 4 cups of liquid. Will come to about 2 cups of eggs and 2 cups of milk. Mix together. Stir in the salt and pepper to the egg mixture. Pour the egg mixture over the bread mixture. Press down the bread to soak in the egg. Cover with foil and let sit overnight in the fridge. In the morning before baking, preheat oven to 350. Bake covered for 20 minutes. Then remove the foil and bake another 20-30 minutes. Serve warm. If overnight is not needed, you can bake after prep. And you don’t need to bake the bread to dry it out. Just use the bread as is.